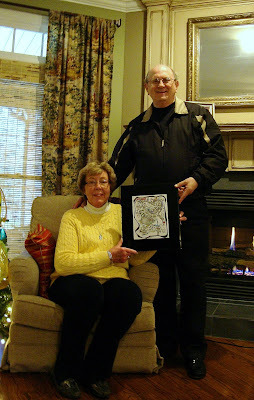 Pictured above are the recipients of the zentangle created especially for them by request of their daughter...who just happens to be a magnificent artist living in the same town as myself. How honored and flattered I was to be able to do this for her, for them! It went all the way up to the last minute, finished in the late afternoon of Christmas Eve. I called Michele (see her blog) and proceeded to frame it. Apparently, they were very pleased with it....that really makes me happy! We left after she picked it up to my in-laws for the evening, returned home to bake a pecan and key lime pie.......then it was time to wait for Santa! You did a FANTASTIC job T. Thank you so much for making my parents Christmas a very special one this year. They have done so much for me over the years and I wanted to give them something spectacular...and THAT is why I called on you! Your Zentangles are truly a gift. Iam glad they liked your zen. It is great. Be happy. This zen is OUTSTANDING!! How wonderful that you made it personal with little tid-bits of their lives woven throughout. I looked closely at every single thing you did. I am amazed at your ablility to assemble all this into such an asthetically pleasing picutre. Definately continue to take commissions and do these. You are so great at this! You've found your niche! I so love the Zentangles! What a great design! I am so excited for you! Your work is beautiful! Wow!! The artwork is great. Your zentangles are so great! No wonder they loved it! OMGosh ... you are so creative. Thanks for dropping by and your nice comment. Have a wonderful new year. what a wonderful treat and i love your new header too, actually much more than the previous one. have a wonderful end of year time with all. OMG this Zen is Wonderful. There arent enough words to say how wonderful and fantastic it is. YOU GO GIRL!!! You have found your calling. Such a nice one and so much fun looking at all the little hidden treasures.